Branson Segway and Adventure Center is a new attraction in Branson that offers more than just fun in riding a personal transporter. Established in spring 2013, Branson Segway is first to introduce in the area a safe and fun rides on Segway personal transporters to visitors coming to Branson. Segway offers a free-roaming adventure ride where you can experience a unique fun ride in a paved track. This amazing attraction of fun adventure offers everyone a thrilling and exciting ride for young and old. Riding the Segway personal transporter is easy and safe for visitors of all ages who come to play at the center’s free-roaming paved track. 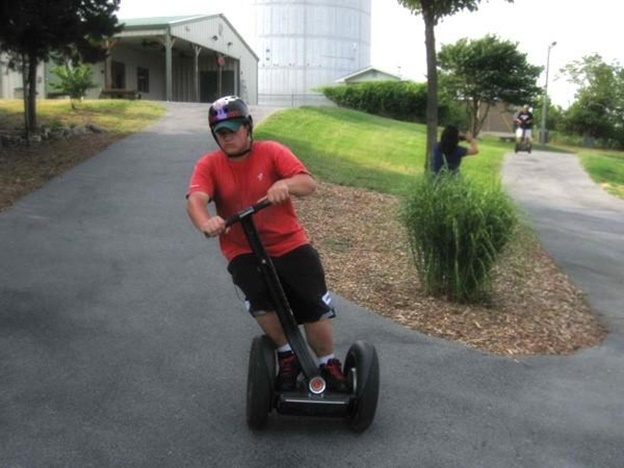 Set on 2 acres of land, the Branson Segway and Adventure Center gives guest the opportunity to ride and explore a wide area on their own individual motorized self-balancing devices, known as Segway Personal Transporters. The Segway moves in whatever direction the rider wants to direct. The center is one of the world’s only free-roaming Segway park with paved tracks that offer exciting entertainment for the whole family. The center made it safe and easy for family and friends to come and play at the free-roaming track. Enjoy the sensation and freedom that Segway offers. Branson Segway is perhaps the world’s only free-roaming Segway park with paved tracks. The self-balancing motorized two-wheeler scooter known as Segway, uses gyroscopes to remain upright which is controlled by the rider. Riders can lean forwards, backwards and to the right and left using a thin handle bar that is attached to a pole. There is no other amusement park more unique to have your next getaway than at Branson Segway and Adventure Center. The center can create great memories for your family meeting or special family occasion. Whether you plan for a get-together party, a reunion, or birthday party, you are sure to love the excitement and thrill of the Segway experience. Segway ride is great for kids of all ages. However, it has a weight restriction of at least 100 lbs. and a maximum of 275 lbs. The center offers riders three different levels of ride and amount of times. Level 1 has a time limit of 7 minutes which is called “test drive” package. Level 2 is a 15-minute ride called “joy ride” which is ideal for folks who want more time to play with the Segway. Level 3 offers a 20-minute ride with the Segway where riders must weigh between 100 and 275 pounds and mature enough to confidently follow instructions. The center employs trained staff to teach everyone how to be safe in riding Segway personal transporter. Everyone is taught how to ride self-balancing with Segway personal transporter. Each rider will be accompanied in the track to make sure they feel comfortable and confident enough to take an adventure ride with the Segway in the paved track. Branson Segway and Adventure Center is a new attraction where you can experience an exciting ride of your life on a self-balancing motorized Segway personal transporter.